Silvia, I’d love to have a discussion a bit more regarding distractions (aka real life) 🙂 I had Grit at an indoor trial with the rest of my dogs this weekend, and I found the environment to be really challenging for her to do her tricks in. I did find that if we went off in a corner, she could do a bit of them there, but she had a very short attention span, and her appetite seemed much lower. I’m curious, on days like that, do you add in easier environments, say in the evening back at the hotel, or do you just let the puppy eat a bit less that day, and see if they are maybe hungrier the next day? Of course, another option is to bring out yummier treats, but I’m resisting the temptation as much as possible. I did bring them out if she found something a bit overwhelming or scary, but this was more for a socialization/classical conditioning purpose, rather than shaping or training. Interesting discusion! I think the most important thing ist the focus and the fun our dogs have doing the tricks. (As we already learned in Silvias course!). Without focus on you also better treats are not so interesting when having lots of distraction. For a performance I only use the tricks which are easy to do and which she really loves to show! I take her in very different places without doing many tricks. Most think to get her calm is on agility-tournaments. Her she gets a click and treat for looking at the running dog while staying calm. Thanks Emely and Melanie, yes, I am very lucky with my puppy, but we also have our problems …and your right they are growing so fast, my small box looks evan smaller than at the beginning! Echo, sleeping on the floor, came over to watch (actually watch!) your video. I hope she learned as much as I did! Very nice job with your young puppy. So impressive. What about playing, would she play? If so, I would focus on playing for now and sneak in some easy tricks while playing. I think she again just needs to learn how to focus in such a busy environment and she could play, she will soon be able to do tricks too. Of course, start with easy tricks that she loves the most and if necessary, go to a corner or outside and if she still can’t eat her meal, I would give her later, back in the hotel. In next lesson, we’ll work on some easier tricks, like spinning and figure 8 forward etc. -- those are great for breaking the ice, most dogs love it and those are easy to reward by toy so you can do them even when she doesn’t feel like eating. -- And then it should be easy to continue. Yes we did a little playing, and she could do a bit of that (but still not too much!). It was very tight inside, so not a ton of room for moving much. Also, there was a bit of a kennel cough scare, so I didn’t want to get her too much in the middle of things. Outside, when we went to potty, I did experiment with running around with her (previously I scared her when I did this!) 🙂 I’m happy to report that she thought this was WAAAAY fun, and even tugged on her leash while doing it! So you are probably right, she again was a little shell shocked (this was her 1st trial after all!). I just noticed as soon as I got home how much more outgoing she was in the house….so a pretty dramatic difference, and I want to make sure I’m helping her! 🙂 I do think if she knows some easy ones, that will help. Her favorite trick to do at the trial was her bowls! I think they are sort of BIG easy targets to her. Heel/side sent her into a fog…. Grit ROCKS those bowls! She’s so smart. We might have a long way to go before being able to drive here and there, but this little step in the right direction makes me think it is possible. Thank you so much Melanie for sharing your tricks and advise for car training. Hugs to you and Grit! She was again drooly on the way home, and then I took her with me to dinner again the next night (TONS more drool). I really thought I had a problem on my hands at this point. It sure felt like all my hard work had been wasted. But we were at a trial, had one more day to go, and were 3 hours from home, so there wasn’t a lot I could do about it. Well, she had a lovely time hanging out with us at dinner, and actually fell asleep in my arms. Interestingly enough, she hopped in the van on her own, and laid down and went to sleep. Next morning was a bit drooly on the way to the showsite. But the drive home was a piece of cake, no drool, and handled 2 different pitstops on the way. Hope that was helpful, and not scary. Which direction is Cik and which is Cap? I don’t want to screw up my first attempt at Slovenian! Well, I’m not Silvia, but since she’s asleep right now…. Good idea with the Kit Kat! I have to find something as logical for me to use, hmm… Would mess up Cik Cap or Kit Kat in no time. Another Cik Cap related question: Do you help a lot with body language when introducing jump wings in cik/cap? I can send Penny around any object small (as a pole) or large (a football goal), but when I try with two objects placed as two jump wings she gets confused if I don’t help her a lot and/or stands closer to the one I want her to wrap around. I also have trouble doing multi-wraps, figure 8 is no problem though. Sure, you should help with body language when there are more objects around. But for now, we’re not doing sends just yet, for now just sit down next to the object and shape her to circle it several times: meaning that we’re working on multi-wraps for now and as there is not much speed involved, you can actually start it inside. Ok 🙂 Will start shaping the multiwrap inside then. And what du you mean with ‘starting inside’ ? Is it just the other way round? It’s multiple wraps: several circles in a row. You shape going around, first clicking for a first step, then two, three, half of a circle, 3/4, full circle, one step over full circle, two steps over one circle, 1 1/4, 1 1/2, 1 3/4, 2 circles, one step over 2 circles etc. With more fluency and less rewarding in between, you will of course get more speed, but you can’t expect a lot of speed with this exercise, you should focus on tightness, in both directions of course. Speed comes with sends, but you need tightness before you can do sends. Sends, you can only practice outside/outdoors, with more room, but you can start with circling inside/indoors -- I was saying that in a reply to Emily who wrote she needs to go outside to make a video. That might be true… but I have a feeling I’ll get confused when watching your DVD, if I don’t do it your way to begin with. When do you add the word? Do you do it the same as other shaping exercises and wait until the dog is doing it really well? That’s true, course walkings can be confusing for those of my students that use the words the other way around 🙂 I add a word as soon as the dog is fluently circling around the object. Silvia, Grit finds walking around her bucket for cookies (cik/cap) extremely boring and keeps leaving to get on her skateboard!! I thought this was really funny. 🙂 I’m trying to keep the rate of reinforcement really high, but it is clearly her least favorite of our new assignments. I’m not sure there’s much to do about it except to keep it simple and fun??? OK, so after tonight’s training session, here’s what I learned. Grit likes a lot of verbal affirmation that I like what she’s doing, and I find it exciting, in addition to the clicker. If I just sit silently and click, she sort of goes through her paces in slow motion, and might even get bored and leave. But if I get excited, she does as well, and I get a lot more animated behavior, and a longer duration of interest. Thinking about this more, I’m wondering if this is the similar to the difference between using “boring” kibble versus exciting yummy treats. I guess my question is, how important is it that she learn to enjoy the “work” without the “crutch” of my squeals of excitement??? Maybe it’s fine that we communicate this way, or maybe it’s a sign that I need to back off and let her figure things out more on her own??? Any thoughts?? I should have mentioned…. I figured out that this was why she was going over to the skateboard and leaving the “cik/cap” bucket behind. She had gotten a touch nervous about the skateboard, so I was making a big deal verbally about her touching the skateboard, and it became a more exciting behavior to offer. At the bucket, I was just quietly sitting there and rewarding behavior (very generously for very small movements, but silently). Later, when I started giving more verbal praise and making excited sounds while she was working around the bucket, I suddenly got much more animated offers of behavior, and she even went back to the bucket by herself while I reloaded with more kibble. I LOVE that she values my praise so highly. I just don’t want to dilute its value or mask an issue that we should possibly work through instead. I hope that all makes sense. How cool with the skateboard! But I guess praising as a prompt/to encourage could be problematic. Not sure if that is what you mean? I click then praise and reward. And a completely different topic: Do you feed raw (I got that impression by what you wrote about your car training) and then use kibble for training? I’d like that but did not know if it was possible (i.e. using lower value food for training than meals). I’ve gone back and forth about how to train with what foods. I found that if I used high value rewards for difficult behaviors and trained those first (as is suggested by many trainers), my dogs would leave work when we got to easy behaviors and kibble. My puppy eventually stopped working for kibble at all. But I still wanted to feed raw. Here’s the solution I hit on, with some help from friend and mentor Melanie (Grit’s Melanie): First I didn’t feed anything but kibble until the dogs were EAGER to work for their kibble (took a single missed meal and about 24 hours — surprised me!). Now I work during the day in 1-4 sessions (depending on my schedule, etc). At the end of the day I feed the balance of their kibble + their raw after all training is finished. This week after training with kibble pretty much exclusively for 2 weeks, I added in some freeze-dried liver as a jack pot when my puppy touched cabinet doors with both paws (this has been scary for her). Oh, my, it was amazing the impact it had. I worried that when I went back to kibble at the next session, that she’d refuse but she didn’t. She ate it like she always does. I think in part it’s because I didn’t use the liver for more than maybe 3 or 4 reps, then it went away and we stopped training while she still really wanted to do more. This is the solution that’s really worked for me. I think that when you have good food drive, it doesn’t matter at all. La once stole a really big amount of meat and could hardly still move, but her eyes went just as crazy for a piece of kibble as they always do. Neither of them has no problems accepting anything offered, even if they just ate something much better as that. I also didn’t really notice they would work harder for something more delicious as kibble. I do bring some canned dog food for Bu to trials as she finds trials scary and I want to make them more fun, but I’m not too sure yummier breakfast makes a big difference. Wow, I sure wish this were the case with my pups. But I think part of it is probably how much value they have in you. As I make training more exciting, they’ll work for kibble when they’re less hungry. But if they just ate a big meal, none of them would work for kibble. I think it will come with time. If they can already switch from raw to kibble, that’s already one step towards it! Pretty much what Rachel said. 🙂 For now, Grit isn’t getting much raw, as we are training so much that she doesn’t need extra food in a bowl. But if she did, then I would give her raw at the end of the day. Thanks Rachel and Melanie, how cool that you’re ‘real-life-friends’ as well 🙂 Can I come live nearby? And kibble-train and raw feed? Amazing that you have a vizsla Melanie, they’re some of the most beautiful and amiable dogs in my opinion. Absolutely -- come live in NC. It’s beautiful and the winters are wonderful (not too cold, but cold enough to be interesting). Lots of dog-friendly places in our area. Maybe not as dog friendly as European countries, but pretty good by US standards. Pizzazzy isn’t really a word -- I made it up. For the first while, I assumed you were English speaking as your first language as your English is great. It used to drive my Dutch grandfather crazy when his American born daughter would make up words (which she did frequently). I guess I get this from her. Later, it was no problem to talk less, but I still always mark the best tries with a voice too. It works great with running contacts training: no click for not a good one, click for a good one, click+extra happy voice for the best ones -- I really think my dogs understand this really well and it really speeds up the learning process. So no, I don’t think there is any bad side-effect to using your voice! Yeah, cik&cap can be pretty boring at first. 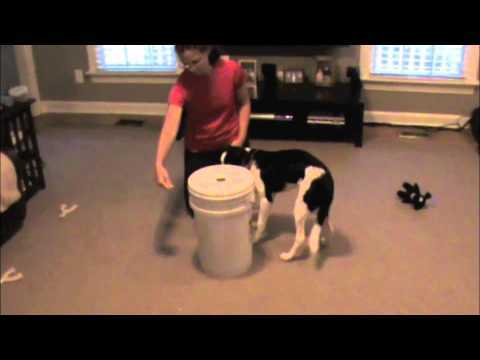 What can do to make it more fun is throwing treats at the base of a cone/bucket -- a little further ahead in the circle from where they are at the moment, so that it becomes “chase those cookies around a cone” game -- they usually like that. But the real fun begins with sends -- but she needs to know the verbal cues to some degree before you can start with those. Haha, even the thrown treats were no comparison to my verbal praise! 🙂 She would walk away from those, but drive into my hand for a kibble if I squealed when she took a step in the right direction. So cool to figure out what makes our little pups tick, isn’t it??? When the skate-board went out of her control, the best would be to just reward, finish a session and give her some days off to forget about it. If she is still unsure about it, give her some days off and then start again on carpet -- that would be a suggestion for everybody who see some fear about the skate board as it moves less, softer, more predictable and without the noise there. Getting there with cik&cap, once she gets more fluent, it would be good to also try it on a thinner object as you can select for tightness better there, reward for bending the back and keeping rear feet close too and little details like that -- but it’s not very important just yet. Side legs look pretty good to me, she was leaning too much on a first video and not having both up in the air much in the second one and now she is standing and having both up, so looks like lots of progress to me! Just keep working on it -- I think you have got the understanding, it’s just the balance that is not there yet and all she needs is more practice. And wow, GREAT figure 8 backwards! Because of her tendencies to wrap behind you on her heel position, that was actually an easy one for her. 🙂 Might make her heel position somewhat worse again, but it goes away once they see those are two different tricks. Maybe just don’t do it in the same session. Don’t worry about her uncertainty with the skateboard too much. I’ve seen her respond the same way when her “4 feet in” box tipped over….offended and uncertain, but she bounces right back if I just take a few steps back and break down the behavior. So tonight, I put the skateboard on carpet, and she was totally fine with it….all motions pushing it forward. However, I think I’ll keep her on the carpet a bit until she understands the behavior a bit better before I turn her loose on quite such a slippery surface! For cik&cap, I focused more on the concept of going to the backside of the bucket tonight to get that a little stronger. I think if she understands that, then I can work on the multiple wraps a bit quicker. Just clicking for a couple of steps at a time over and over just seemed soooo boring to her! Great point about side legs…her balance must be improving, as tonight I also got her little bowl out for 4 feet in, and she was FAR better at getting that 4th foot in…I think another sign of improved balance! Haha, yes, I think she was made for the backwards figure 8. 🙂 We are separately working on her heel/side. The good news is, teaching the figure 8 has increased the value of heel/side tremendously, so she’s getting much more confident about beginning that behavior (remember it was hard for her without a “prop”). Great! Her balance sure is improving, but yes, those tricks don’t require understanding only, but take some practice too. And sure, it’s actually not a bad idea at all to stay on carpet a little longer, they really need to learn to push there. 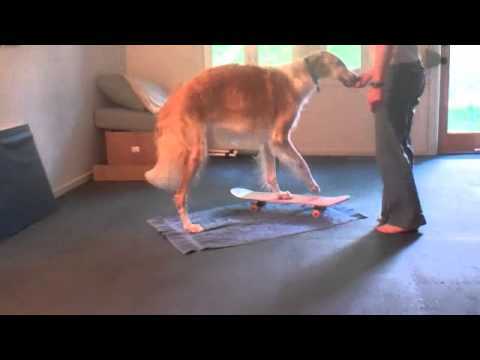 Does she get barky with other tricks too or is it just the board that excites her that much? How is she with bikes, cars and/or other dogs running around? I’m just asking to see if this is a bigger problem we need to address or it’s just the board that makes her like that? Anyway, what I would do is to start it from zero again, but inside, on carpet and even fixing the wheels completely at first, leave the board there and see if she can ignore it in this situation. If not, I would first turn it up side down to make it look different and then turn it around again once she starts ignoring it. Then start shaping for stepping on it calmly, then allowing it to move some, but very little and tell her to down if she gets too excited again. -- Just to make her see that she needs to control herself if she wants to play or the game stops. I think this would be a good lesson for her to learn anyway, even more important one as skate-boarding as such, so take it slowly, progress very gradually. And let us know how it goes! I agree she needs to learn this impulse control so this will be a perfect way to learn. Good idea using the skateboard as distraction! That would be a great challenge for my little lady! By the way, tomorrow I’m going to the first ‘clicker challenge’ in south germany! You have to learn your dog some definitely new tricks in a certain time only using ‘free shaping’ with the clicker and without luring or known commands. Hope to get lots of new ideas and a lot of fun there. Sounds fun! Let us know what tricks you had to teach! Here’s our video for Lesson 5. I’m having the most fun with backwards figure 8s and would really like some advice on my next step with Echo. Finn… well, if I can get him to back under one leg once and both of us stay standing afterwards, it’ll be a win! Side Legs -- I’m focusing on clicking for both legs on the object and jack pots for simultaneous leg raises (which I’m starting to get with Echo -- YAY!). I’m finding that she tends to stand very close to the target, though and I think that might be part of our challenge. Ideas? Cik Cap -- I’ve taught the dogs to go around a cone with the direction determined by my body language. I went back to free shaping here so that I can shape multiple wraps. Any advice welcome. Finn is at a similar point to Echo. I’d like more speed, enthusiasm. Should I shape the multiple wraps first or get the enthusiasm first? Great! Some of those side legs lifts were perfect! I think we’re almost there now, she just needs some more balance and strength, it’s not an easy trick for big dogs! From now on, I think she just needs practice I wouldn’t worry about where she stands. And wow, can’t believe you actually got half of the figure 8 backwards with Finn! It’s a hard one with such a tall dog! With him, it would probably be easier if you first teach circling you backwards when you stand still -- it’s the same as figure 8, only that they don’t need to change the direction inbetween -- AND don’t need to go through your legs what will make it easier for both of you. After he knows it in both directions, it should be easy to put it together in a figure 8. Echo would also need to do some more circling around your leg -- for now, you help a lot by stepping over her. Try to step over her less and less so that she needs to do more&more on her own: meaning that your next step would be stepping as you do at 3:52 and not anymore as much as you do at the try just before that one for example. Nice skating tricks! 🙂 Time to only reward when they make it move. What you’re going for is more of a bow position: they can’t make it move when they stand straight on it. You need lower position in the front, a kind of a bow, that will make it move -- you can help some with low placement of the reward. Getting there with multi-wraps! Make sure you reward in the direction to promote circling, like on last tries. You will get more speed once there is less rewarding in between and especially when you switch to a toy -- I switch to a toy as soon as they can do to wraps in a row, it makes the game more fun. But of course, you can’t expect that much speed on multi-wraps as you can expect on sends! Both are important, but I teach multi-wraps first to get the tightness first. Thank you, Silvia. Echo and I are already getting her doing the work to go between my legs -- sure makes my job easier!! Great idea with Finn going backwards around me first. We’ll work on that. I’ll proceed as you suggest on the other things. Great! Once you master the steps backwards (vs. stepping OVER her), slowly make the steps shorter&shorter, so that she needs to turn more&more to get in between. Heidi is too funny with her balls! She doesn’t seem to mind the noise at all! 🙂 Great stays and really speedy recalls too! Would you mind describing what “a day in the life of your puppy at an agility trial” looks like? I’ve been having fun thinking about this a bit. We have sooooo many choices with how we can spend our puppy’s time at a trial. There are lots of things for them to learn. I’ve been working to balance Grit’s time between “learning the ropes” (hanging out in her crate or expen, learning that everyone gets their turn, going potty “in public”, it’s fun to get in/out of your crate, etc), socializing (meeting friendly people and dogs, keeping an eye out for anything that she finds scary so that we can see if we can change her opinion, learning to “hang out” at a trial), and then interacting with me (playing with toys, chasing me, shaping tricks she thinks are fun, etc). It just got me wondering how you spend your time with your puppies, especially when you have several other dogs to run in agility??? I found that between 16 year old Cole, my 3 active dogs in agility, and puppy Grit, I was very, very busy!! !